Close Landmarks: Deerhead Tavern within two blocks of Laundry. Driving Directions from Highway 41: Go to Columbia Street (just north of Lloyd Expressway at Big Liberty Pull Signs). Drive west on Columbia Street toward First Avenue. Turn right (north) on Garvin Street. Go one block and turn left on Maryland Street. Go two blocks and turn left on Governor Street. Family Laundry located on the left. 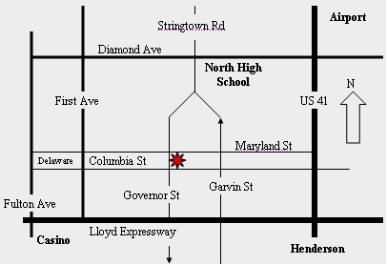 Driving Directions from First Avenue: Go to Columbia Street (Hacienda Restaurant). Drive east on Columbia Street toward Highway 41. Turn left (north) on Lafayette Street by Deerhead Tavern. Go one block and turn right on Maryland Street. Go one block and turn right on Governor Street. Family Laundry located on the left. Driving Directions from Lloyd Expressway: Go to Garvin Street (just west of Highway 41, take Main Street exit). Drive north on Garvin Street. Go few blocks and turn left on Maryland Street. Go two blocks and turn left on Governor Street. Family Laundry located on the left. Driving Directions from Diamond Avenue: Go to Stringtown (next to North High School). Drive south on Stringtown Road. Family Laundry located on the left just before traffic light at Columbia Street. Family Laundry is located in the heart of the City of Evansville, thus making it convenient for residents and businesses of Greater Vanderburgh County, including those of Newburgh, Princeton, Chandler, Henderson, Mount Vernon and surrounding counties to have quick access to the most modern laundry in Southern Indiana. Furthermore, Family Laundry (lavandería automática) is centrally located in the triangle formed by University of Southern Indiana, University of Evansville and Ivy Tech, that students also have easy access to a modern laundry (lavandería automática) with a full-line of entertainment. Laundry offers professional, private and affordable wash-dry-fold laundry plans. Family Laundry is the newest and cleanest laundromat in Town! We welcome the Spanish community: Hispanics and Latinos! Owners of washers & dryers can benefit greatly by doing their laundry in a Modern Laundromat!